At present, i-PRF is still in its infancy and needs to be explored with regard to its properties. Hence, the present study was designed to evaluate the platelet count, and antibacterial efficacy of i-PRF in comparison with the other available platelet concentrates, i.e., Platelet rich fibrin (PRF), Platelet rich plasma (PRP), and control (whole blood). Blood samples were obtained from ten chronic generalized marginal gingivitis patients who reported to the Department of Periodontology at our college and volunteered to participate in the study (mean age 32 ± 5.6 years). All were nonsmokers, with no history of infection or any antibiotic use for at least 3 months before the study. None of them gave history of any anticoagulant or immunosuppressive therapy that might interfere with natural coagulation process. None of them reported of any bleeding or clotting disorders. All the patients gave written informed consent before beginning the study. This research was approved by the institutional ethical committee and strictly adhered to the guidelines of the Declaration of Helsinki. A volume of 8 ml of blood was collected from each patient: 2 ml was used for preparation of i-PRF, PRF, and PRP, remaining 2 ml with anticoagulant served as a control [Figure 1]. 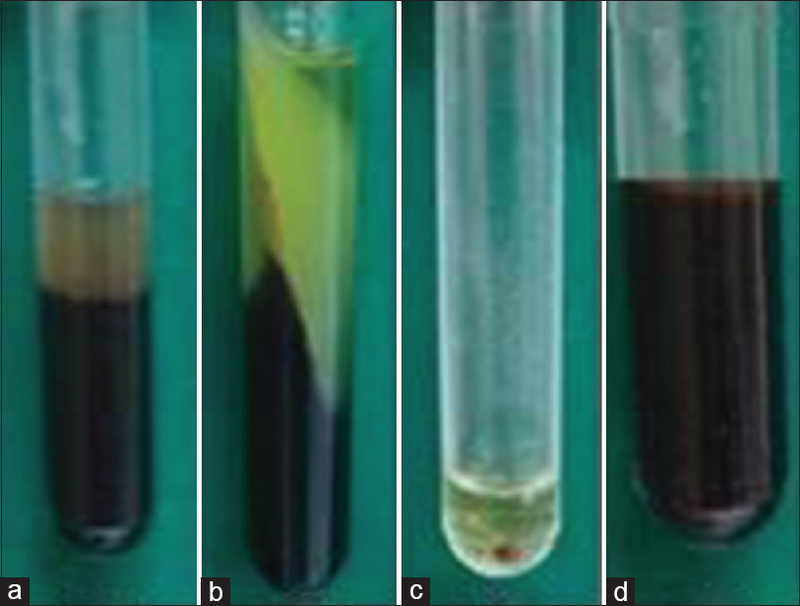 During centrifugation, a tube containing 2 ml saline served as a counter balance. A volume of 2 ml of blood collected in noncoated vacutainer without any additives and centrifuged at 700 rpm for 3–4 min. A volume of 2 ml of blood collected in silico n-coated vacutainer without any additives and centrifuged at 3000 rpm for 10 min. A volume of 2 ml of blood collected in 3.2% sodium citrate anticoagulant-coated vacutainer. Initially, soft spin at 1000 rpm for 10 min, followed by centrifuging top layer of plasma at hard spin at 2000 rpm for 20 min. Finally, half of the superficial plasma layer removed, and the platelet pellet suspended in the remaining half of the plasma volume. A volume of 2 ml blood collected in ethylenediaminetetraacetic acid anticoagulant containing vacutainer which was not subjected to any centrifugation. Supragingival plaque samples of subjects who volunteered for blood sample collection were obtained using gracey curette (Gracey curettte, Hu-Friedy Mfg. Co., LLC, Chicago, USA). The sample was immediately transferred in tube containing 5 ml saline and vortexed for 5 min to obtain uniform suspension. Later, 0.1 ml of this suspension was then used to plate blood agar (HiMedia Laboratories Pvt. Ltd., Mumbai, India) using streak method. Wells were prepared in the inoculated agar plate. 0.1 ml of i-PRF, PRP, and control were placed in those wells. A punched piece of PRF membrane was placed on inoculated agar plate. Inoculated blood agar plates were then incubated in an incubator aerobically at 37°C for 48 h [Figure 3]. The same procedure was repeated for all the samples. For antimicrobial potential, the comparison between zones of inhibition obtained around all the samples was analyzed by one-way ANOVA. Comparative evaluation of the number of platelets was also done using ANOVA. P <0.05 was considered statistically significant. For statistical analysis, “SPSS-9” software (IBM India Pvt Ltd, Bangalore, India) was used. Platelet count/mm 3 obtained for i-PRF, PRP, PRF, and control were 1,434,000 ± 75,233, 1,343,000 ± 81,486, 249,000 ± 61,319, and 291,000 ± 51,575, respectively. The platelet count of i-PRF was statistically significant when compared to control (P< 0.001). It was also significant when compared to PRP (P< 0.01) and PRF (P< 0.001). This indicates that i-PRF has maximum number of platelets in comparison to other concentrates. The antimicrobial efficacy was demonstrated by appearance of a clear zone of inhibition around the samples. Mean zone of inhibition (in cm) around i-PRF, PRF, and PRP were 1.42 ± 0.25, 1.3 ± 0.16, and 1.02 ± 0.12, respectively. Mean zone of inhibition around i-PRF (P< 0.01) and PRF (P< 0.05) reached statistical significance. Although a distinct zone of inhibition was seen with PRP, it was not statistically significant (P > 0.05). 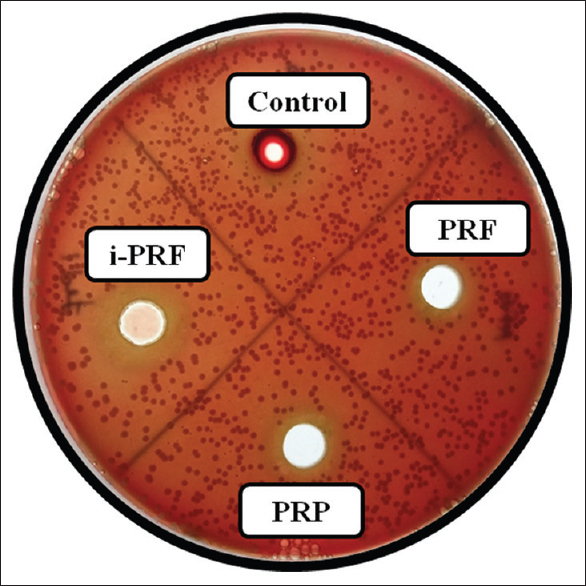 These results indicate that i-PRF has a significant inhibitory effect on growth of oral bacteria in comparison to other platelet concentrates. Periodontal regeneration involves various biologic events such as cell adhesion, migration, proliferation, and differentiation in an orchestrated sequence. Regenerative procedures with the use of soft- and hard-tissue grafts are performed to attain periodontal restoration. Platelets play a vital role in wound healing. They release growth factors such as platelet-derived growth factor (PDGF), transforming growth factor (TGF-β), and insulin-like growth factor once they are activated. Platelets also secrete fibrin, fibronectin, and vitronectin, which act as a matrix for the connective tissue and as adhesion molecules for more efficient cell migration. Thus, they play a crucial role in cell proliferation, collagen synthesis, and osteoid formation.,, This led to the development of numerous techniques of autologous platelet concentrates over the years such as PRP and PRF. PRP although being an autologous preparation requires the addition of thrombin and calcium for its activation. These additives can result in the development of antibodies to the clotting factors V, XI, and thrombin, thereby adversely affecting the coagulation process and also can trigger an immune reaction. PRF is the second generation platelet concentrate introduced by Choukron (2001). It is easy to prepare and has good handling characteristics. It does not involve any use of bovine thrombin or anticoagulant which considerably reduces the biochemical handling of blood as well as risks associated with the use of any additives. PRF itself contains physiologically available thrombin that is responsible for slow polymerization of fibrinogen into fibrin resulting in a physiologic architecture favorable to wound healing. This fibrin network protects the growth factors from proteolysis. Besides, PRF also favors the development of microvascularization leading to a more efficient cell migration. I-PRF was introduced based on the similar concept as that of PRF with added advantage of it being in injectable form. This injectable form of PRF can be utilized alone or combined easily with various biomaterials. Its protocol is based on the concept that slower and shorter centrifugation spin results in a higher presence of regenerative cells with higher concentrations of growth factors. In a recently conducted study, it was observed that PRP slowly dissolved over a period while i-PRF formed a small clot as a result of fibrin components that acted as a dynamic gel with cells likely contained within its hydrogel. It was therefore hypothesized that an additional release of growth factors from i-PRF can be excepted beyond 10 days although PRP was found to be dissolved by that time. Evaluation of platelet counts can be done by various automated devices. However, in a study done by Bajpai et al. to estimate the platelet count by peripheral smear method and by automated cell counter, it was observed that there was no significant difference in the two methods. The authors concluded that the method of platelet estimation by peripheral smear is useful as a rapid, cheap method to assess platelet count. In the present study, all the samples except PRF were available in liquid form which could be easily smeared on glass slide and stained. As PRF was available in a clot form; its platelet count was indirectly calculated by evaluating the platelets available in residual serum. Similar evaluation was performed by Suchetha et al. for estimation of platelet count in PRF clot. In the present study, it was observed that i-PRF had highest number of platelet count and it was statistically significant. This could be attributed to the low centrifugation speed and time resulting in their higher number. Ghanaati et al. introduced the “low-speed concept” for blood centrifugation whereby lower centrifugation speeds were shown to contain higher numbers of cells including leukocytes before the formation of a fibrin clot. In the present study, it was observed that i-PRF and PRP showed 503% and 464% rise in number of platelets. PRF clot showed the concentration of about 87% of platelets when compared to whole blood. Preparations with higher platelet counts are known to release more growth factors. Miron et al. demonstrated that in general PRP had higher early release of growth factors whereas i-PRF showed significantly higher levels of total long-term release of these factors. It was concluded that i-PRF can release higher concentrations of various growth factors and induce higher fibroblast migration and expression of PDGF, TGF-β, and collagen1. Studies evaluating the antimicrobial efficacy of platelet concentrates such as PRP and PRF have been previously carried out. i-PRF being recently introduced is not much explored. In the present study, it was observed that i-PRF showed maximum zone of inhibition around oral microflora, i.e., 1.42 ± 0.25 (in cm). The order of zone of inhibition from highest to lowest was i-PRF > PRF > PRP. In one study, antimicrobial efficacy of PRP and PRF was performed against Porphyromonas gingivalis and Aggregatibacter actinomycetemcomitans. It was seen that P. gingivalis and A. actinomycetemcomitans were inhibited by PRP but not by PRF. In another study, PRF demonstrated clear zone of inhibition against subgingival plaque sample and minimum amount of turbidity using PRF was confirmed by colorimetric analysis. In the present study, although a distinct zone of inhibition was obtained with all test samples, it was significant with only i-PRF and PRF. Various mechanisms have been hypothesized regarding the mechanism of antibacterial effect of platelet-derived preparations such as generation of oxygen metabolites, including superoxide, hydrogen peroxide, and hydroxyl free radicals; binding, aggregation, and internalization of microorganisms, thereby enhancing the clearance of pathogens from the bloodstream; release an array of potent antimicrobial peptides. Yeaman proposed that direct interaction of platelets with microorganisms, participation in antibody-dependent cell cytotoxicity and engulfment by entrapped white blood cells within PRF could result in direct bacterial killing. Besides this release of myeloperoxidase, activation of the antioxidant responsive elements and antigen-specific immune response have also been suggested. Comparative evaluation of release of growth factors could not be performed due to lack of facility. In addition, identification of bacteria inhibited by all the test samples was not performed. Evaluation of antibacterial activity in dynamic environment is required. The use of platelet concentrates in periodontal regenerative therapy is increasing nowadays. With i-PRF, its application can be more feasible and minimally invasive without using any additives for its preparation. Within the limitations of the study, i-PRF had the highest number of platelets. Its antimicrobial potency was also highest when compared to other platelet concentrates. Since there is limited literature related to this novel platelet concentrate further research is required to explore its properties. More in vitro and animal studies are required to establish its healing and regenerative efficiency. Miron RJ, Fujioka-Kobayashi M, Hernandez M, Kandalam U, Zhang Y, Ghanaati S, et al. Injectable platelet rich fibrin (i-PRF): Opportunities in regenerative dentistry? Clin Oral Investig 2017:2:1-9. Malok M, Titchener EH, Bridgers C, Lee BY, Bamberg R. Comparison of two platelet count estimation methodologies for peripheral blood smears. Clin Lab Sci 2007;20:154-60. 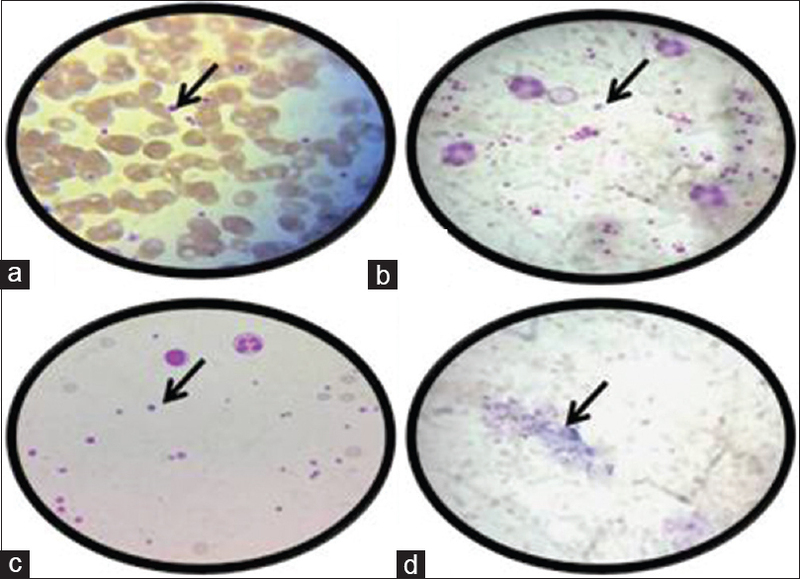 Bajpai R, Rajak C, Poonia M. Platelet estimation by peripheral smear: Reliable, rapid, cost-effective method to assess degree of thrombocytopenia. Int J Med Sci Res Pract 2015;2:90-3. Aggarwal A, Singhal N. Evaluation of content and distribution of platelets in platelet rich fibrin at various centrifugation time periods: A light microscopic study. Int J Dent Med Res 2015;1:61-4. Preeja C, Arun S. Platelet-rich fibrin: Its role in periodontal regeneration. Saudi JDent Res 2014;5:117-22. Suchetha A, Lakshmi P, Bhat D, Mundinamane DB, Soorya KV, Bharwani GA. Platelet concentration in platelet concentrates and periodontal regeneration-unscrambling the ambiguity. Contemp Clin Dent 2015;6:510-6.